Profit is the surplus revenue after a firm has paid all its costs. Profit can be seen as the monetary reward to shareholders and owners of a business. In a capitalist economy, profit plays an important role in creating incentives for business and entrepreneurs. For an incumbent firm, the reward of higher profit will encourage them to try and cut costs and develop new products. If an industry is profitable, it will encourage new firms to enter. If a firm becomes unprofitable, it will either have to adapt and change or close down. This profit motive can help increase efficiency, provide greater choice for consumers and allocate resources according to consumer preferences. However, profit can have a downside. 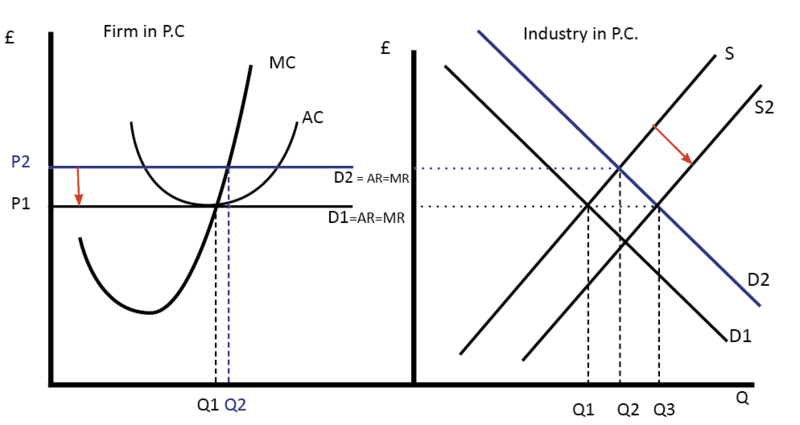 To increase profits, firms may take action which cause market failure. For example, an asset stripper could buy a failing firm – selling off its assets and then make workers redundant. Alternatively, a firm may increase profits by finding ways around environmental regulation and cause more pollution. Also, a firm may seek short-run profit maximisation and under-invest in the long-term. Behavioural economists argue that economics can often over-emphasise the role of profit. For example, individuals are motivated by many factors other than profit, such as pride in work, desire to work in bigger company, be successful and attachment to ideas – even if unprofitable. 1. Investment in Research & Development. Higher profit enables a firm to spend more on research and development. This can lead to better technology, lower costs and dynamic efficiency. This profit is particularly important for some industries such as oil exploration, drug research and car manufacturing – which require significant risky investment to develop. Without this profit and investment, the economy will stagnate and lose international competitiveness, leading to job losses in some sectors. 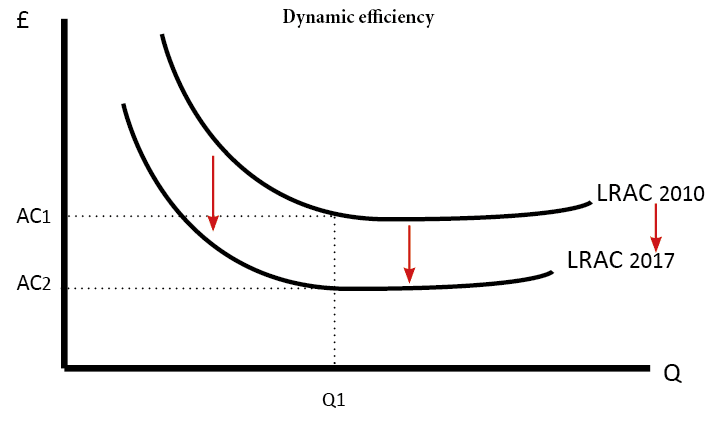 This is a graph showing dynamic efficiency – a fall in long-run average costs due to investment in more productive technology. Without supernormal profit, this investment may not occur. Shareholders are given dividends. Higher profit leads to higher dividends and encourages people to buy shares. Shareholders are an important source of finance for firms. Profit is important to be able to remunerate shareholders. It is the hope of future profit that enables firms to raise finance from shareholders to finance expansion. Low profit may make a firm the target of a takeover bid. If a firm appears to be under-performing, shareholders may feel they are better off selling to a firm wishing to take them over. If the price of oil is high then it will become more profitable. These profits should encourage firms to develop new oil fields. With mobile Apps becoming more profitable, it will encourage more firms to enter. In this example, a price of P2 gives supernormal profit (AR>ATC). However, if the market is perfectly competitive, this profit encourages more firms to enter. 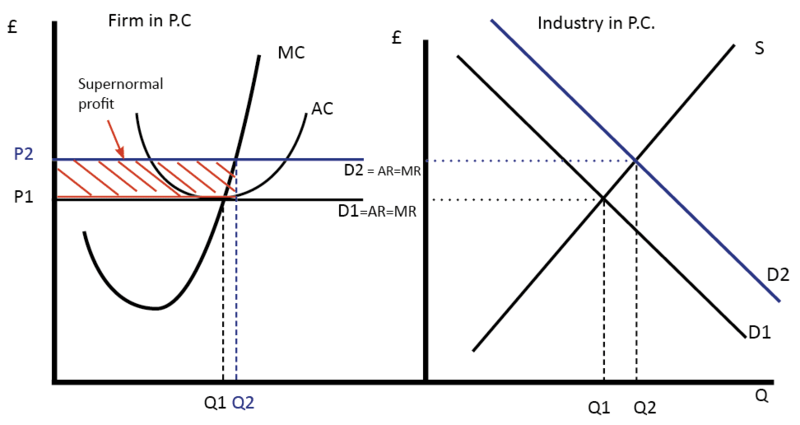 Supply increases and price falls until normal profit is made (at P1 where AR=ATC). In the long-run profit returns to a normal profit level. Profit can be saved and provide insurance for an unexpected downturn, such as recession or rapid appreciation in the exchange rate. This is important for volatile industries, like luxury products. Luxury goods may be very profitable in boom years, but make a loss in recession. 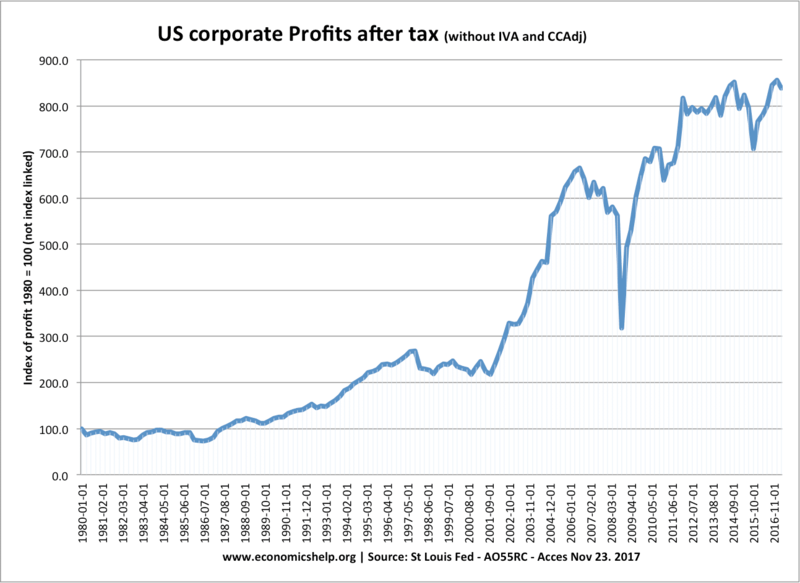 Company profit levels in the US. This shows the dip in profit during the recession, but sharp rise after. In theory, higher profit should enable higher wages for all workers. 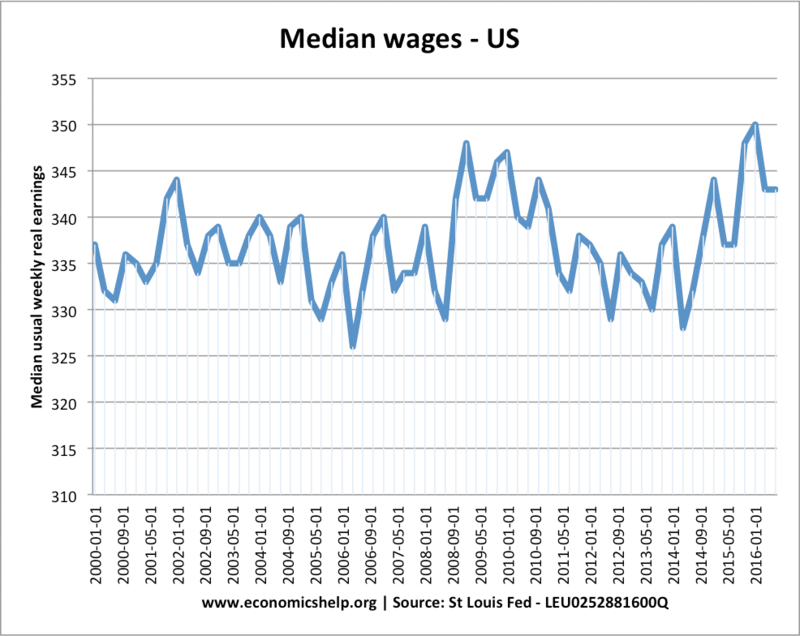 However, this graph shows that rising profit levels do not necessarily lead to higher median wages. Higher profit acts as an incentive for entrepreneurs to set up a business. Without the reward of profit, there would be less investment and fewer people willing to take risks. In a command economy, there is no profit incentive but this can easily lead to a lack of incentives. 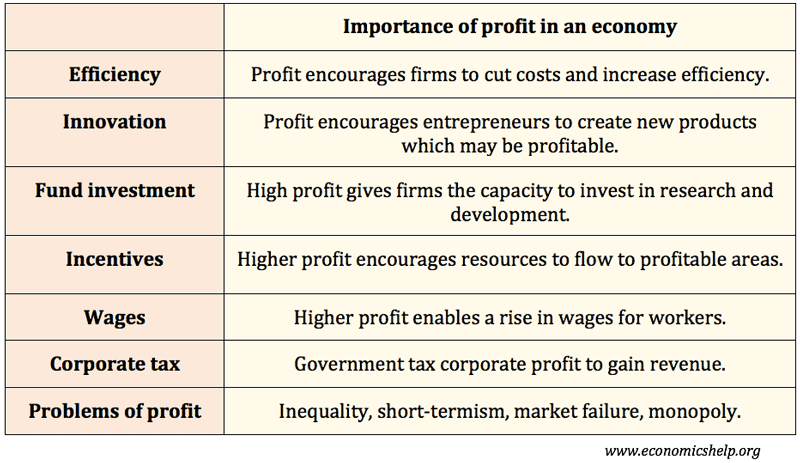 Though profit plays an important role in an economy, it is worth bearing in mind. Higher profit may lead to greater inequality in society. It depends whether firms have monopoly/monopsony power. The pursuit of short-term profit can encourage risk-taking and reckless behaviour. For example, commercial banks took more risks in the 1990s and early 2000s; this contributed to the credit crunch. When wil de Nigerian economy grow 2 b like odas?